Kathryn's early searches via the Internet threw up the Victorian Women’s Football League and also on the net she found the USAFL site. Using the chat forums of the US site she suggested that a women’s clinic should be held at the 2003 nationals. Leigh Swansborough of California saw that post and took it a step further to organize teams to play in the inaugural women’s match in the US. Bringing American women to play the game will be her challenge, “the most important thing is that it just looks fun! Athletic women will probably also play other sports so it works out well to market it as an off-season conditioning for their main sport.” Support from local women’s rugby clubs has been encouraging and they have indicated that they will direct their players to Aussie Rules when their season is completed in June. It is expected that most women’s teams will develop out of the existing men’s teams, “You need someone who knows the game and can train new recruits.” Kathryn hopes that all clubs serious about developing women’s teams will have a page on their website, as well as links from and to http://womensfooty.com. She also feels that there may be a time in the future when a women’s team may develop first in a city with a men’s team following from this. Currently there are teams in Minnesota (Morrigans), Milwaukee (UWM), California (OC Bombshells and Valley Vandolls) as well as Atlanta and Florida having women's team in the works and indications of interest from a few others. It is hoped that the official announcement of the women's division at nationals will see more teams forming. Even though the women’s game is in it’s infancy, there is still an eye towards potential international football with a Queensland team possibly traveling to the US to play in the US Fall and potentially to be included in the Nationals tournament this year. In the longer term Kathryn’s goals for women’s footy in the US are to establish a stable competition in as many cities as possible, to have a corresponding nationals level for more committed players, and some form of international competition. 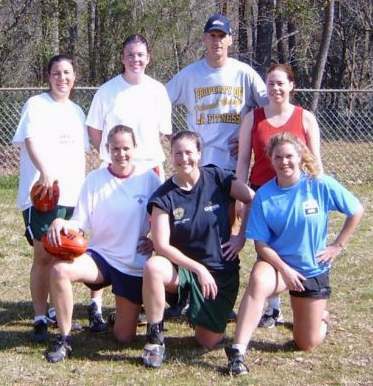 In a future coming together of the sexes she says, “I’d also like to see co-ed recreational footy get a toehold in the US.” Given the rise of men’s Aussie Rules in the US in a relatively short time span there is great hope that the women’s game can follow closely in its footsteps. For further information go to womensfooty.com.